Prior to actually playing the Switch, it seemed the system itself was the star of Nintendo’s latest game console. Rather than a big hunk of plastic that you leave plugged into your TV, the Switch is a tablet. You can lock a controller onto either side of the screen—each pad resembling one half of your typical Xbox or PlayStation controller—and play it like a giant Game Boy. You can set it down on a table using the kickstand on the back, slide the controllers off, hand one to a friend, and have a portable multiplayer gaming machine. Or you can jam the Switch into a dock that’s connected to your TV and play games on the big(ger) screen. That convertibility was the whole of Switch’s identity for months as Nintendo went dark ahead of a day-long preview extravaganza last week. After spending several hours with the console in my own hands, I came away feeling that focus was something of a feint. It painted the Switch as a relatively safe console, a new form, yes, but one still catering to traditional video games with traditional controls. But the truth is, Switch, like the DS, Wii, and, to a lesser extent, the Wii U before it, is another Nintendo-driven experiment in how games are made and played. The real star of the show isn’t the console, but those little controllers, which have been given the most Nintendo name possible: “Joy-Con.” (That’s both singular and plural, for the record.) Aside from a microphone to pick up voice commands, Nintendo has jammed just about every control method around into those four-inch wonders. For your everyday button-pressing needs, they have the layout of a Super NES controller, only the d-pad is replaced by an analog stick when you’re holding one horizontally. You can use them individually like that to play simple games, such as Sonic Mania or Super Bomberman R, but the tiny Joy-Con and cramped buttons do not make for the most comfortable of experiences. You’re better off mounting the controllers to the grip that’s included with the system, a little piece of plastic that joins the halves together into something more akin to a PlayStation or Xbox controller. It’s functional, but even this isn’t a perfect way to play; the grip is a little lighter and narrower than one might expect. For purists, there’s the Pro Controller (sold separately and priced at a whopping $70, as if Nintendo knew people who spend lots of time playing games will be willing to shell out big bucks for something more comfortable), which sticks to the layout set by Microsoft’s Xbox pads and includes some of the Joy-Con’s bells and whistles (more on those later). It’s not perfect—it’s lacking the squeezable trigger buttons that have become standard on modern controllers—but it was by far the most comfortable controller I used at the Switch preview event. Of course, you can also append the Joy-Con to the tablet itself and play the system as a handheld. It’s hard to judge just how this will feel in the hand, since every opportunity I had with this configuration was weighed down by brackets and wires, but it’s worth noting the Switch is a regular, flat-backed tablet. There’s no ergonomic curvature on the back, like the Wii U Gamepad, to alleviate the awkwardness of holding onto a slim, yet somewhat heavy, screen. But there’s a lot more to the Joy-Con than just a bunch of buttons. Each half is capable of Wii-like motion controls, although the system does not require the unwieldy sensor bars that made the Wii tick. When playing ARMS, a new Nintendo fighting game that packed a surprising amount of depth behind its shiny exterior, that motion-tracking felt intuitive and accurate, allowing you to quickly steer the direction of your robotic limbs after a throwing a punch. 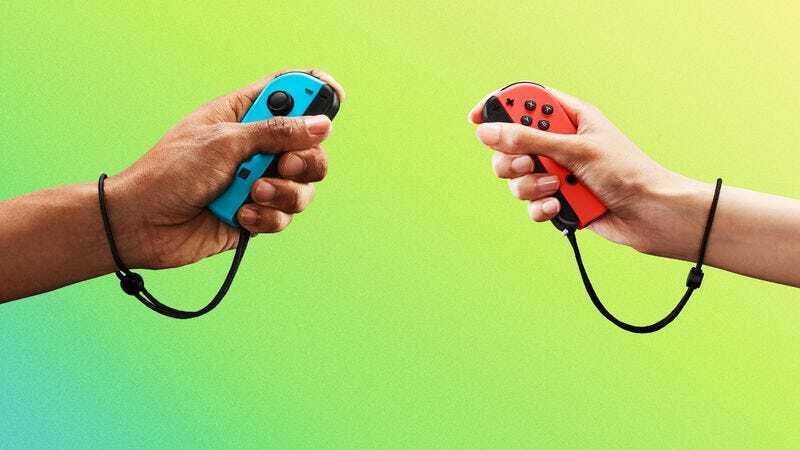 Even still, Nintendo seems to have learned that not everyone wants to flail around when playing games, and has made sure ARMS is also playable without motion controls, yet another example of the flexibility the company has found itself practicing as of late and built the Switch around. The right Joy-Con, because there is a difference between the button layout and functionality of each half, also includes an infrared camera that can detect some simple gestures, kind of like Microsoft’s Kinect camera. I didn’t get to experience this in any games myself, though I do know 1-2-Switch, Nintendo’s gonzo screenless party-game compilation that acts as showpiece for the system’s stranger functions, includes a mini-game where you hold the Joy-Con in front of your mouth like a hot dog and chomp as quickly as possible to eat a bunch of virtual sandwiches. Like all the other amusements in 1-2-Switch, it’s the kind of bizarre, charming one-off idea that needs to be slapped into a WarioWare title alongside 200 other micro-games, not packed onto a disc with a few dozen more proof-of-concepts and sold separately for $50. Also on display during my 1-2-Switch demo was the Joy-Con’s most mystifying and intriguing feature, something Nintendo is calling “HD Rumble.” As Yoshiaki Koizumi, one of the new console’s designers, explained in a whimsical video during last week’s livestream, the Joy-Con (and the Pro Controller) use precise vibrations to simulate oddly specific sensations in your hands. In this case, I had to hold the Joy-Con in my palm and pretend it was a box full of marbles. Tilting it around would make it feel like little balls actually were rolling around inside the controller: If I flicked one end up, they’d come bouncing back down; if I titled the controller vertically they’d come crashing hard against the bottom. While ARMS was easily my favorite game at the event, nothing came as close to that classic Nintendo magic as rolling around those virtual balls. Yes, it’s yet another novelty that’ll probably only be taken advantage of by a handful of odd games, but it was something new and different. I walked away thinking “How the hell did they do that?” and dreaming about all the weird games Nintendo and other imaginative developers might conjure up. That’s the thing about the Switch, as I’ve experienced it so far. It’s the best of both Nintendos, just as capable of being traditional and polished as it is radical and wacky. Straightforward games, like Zelda: Breath Of The Wild and Splatoon 2, will find themselves right at home, but the versatility in those Joy-Con give the system a huge potential for smaller, more far-out fare as well. To its credit, Nintendo seems to be fostering that kind of creativity in recent years, both within its own confines, with games like Boxboy! and Pocket Card Jockey, and among independent developers, even taking on projects like the charming puzzler Snipper Clips, which was one of the preview event’s most buzzed about hits. Should it keep courting small, creative studios and producing its own unusual side projects, the Switch could be home to some riveting weirdness, which would be a surprising little cherry on top of all the great Nintendo-produced blockbusters the console is guaranteed to deliver. Whether the Switch will be in enough households to make it worthwhile for developers to pursue publishing games on it, well, that’s the million dollar question, and we won’t be getting an answer until well after the Switch launches on March 3.